middle of the week...ho hum. good thing i have this tropically festive dress to wear! i really should be going to a luau but instead im at the office, in front of a computer. i am barefoot though! maybe i'll play some island music today and sway in the wind, the wind from the air conditioner. to the movies to see magic mike! for serious, that's what i'm doing after work tonight with my lady wolf-pack. dinner and a movie about strippers. oh hey there wednesday, you're looking mighty fine all of a sudden. also fine, the living room in the house that will be ours for just 3 more weeks. wah. That dress! That dress! That dress! It's fabulous. Why didn't I have that for MEXICO? Yay for your hump day plans! That house looks amazing...congrats on it! How excited that will be in 3 weeks!!!! Can I join your work luau? It is hot as heck in our apartment. You are too cute! I need to round up some girls and go see Magic Mike. I hear it's quite laughable. And yes, your living room is really cute, but considering the style you have, I think you'll be even happier with your new home! pretty dress doll. 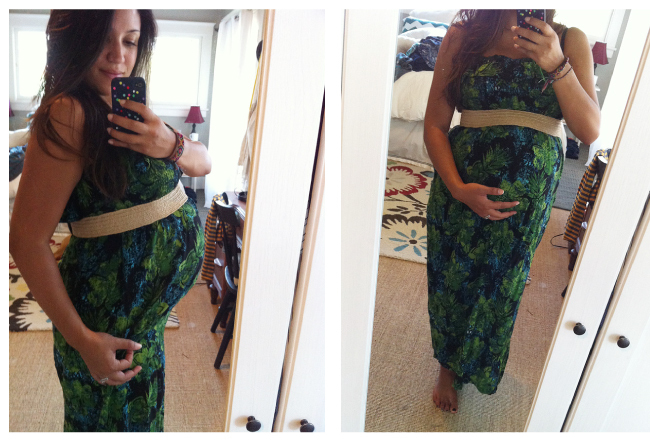 your bump is rapidly grown AND I think that it is so cute. enjoy the movie! You will make the next living room just as cozy! (Says the girl who insists on a bottle of champagne when packing the last box when we move...) No really though, I actually just blogged about it. "There are far better things ahead than the ones your leaving behind." Like baby boys and new opportunities to decorate! I love that dress! You are too cute! Cute dress!!! You look great! I'm looking forward to seeing you soon sweetie!!! Got lots of stuff for River in London!! Oh my, what a gorgeous dress! You look lovely. Enjoy watching Magic Mike - I can't wait to see it! I will miss that living room. Will you invite the wolf pack over before you move?? In LOVE with your mantle arrangement! Can I just say how much I LOVE your dress?? oh and i've been obsessed with your fireplace for a long time. the secret is out!